Many thanks to all who assisted at the 40 hours at St. Margaret Mary - especially those who ventured out through the snow. We pray that the graces received through this devotion may make a deep impact on our lives this year. There is a walk-in Lunch Club serving tea, coffee, homemade cakes and scones, homemade soup and light lunches from 10.00 am to 2.00 pm Monday to Wednesday and Sunday Lunch from 12.00 - 3.00 pm - includes a children’s menu. Please support this new initiative which supports the work of the parish. For more information contact the centre manager, Trevor Tiffin on 524295. On Thursday morning at 10.00 am. Please come along if you are able - the more the merrier. Bishop Michael Campbell has agreed to come to the parish on Tuesday 28th April [at Christ the King] to celebrate the Sacrament of Confirmation. The next class will be on Wednesday 11th February - it’s still not too late to join the group. First Holy Communion will be celebrated in the parish on Sunday 14th June - our parish feast day weekend. 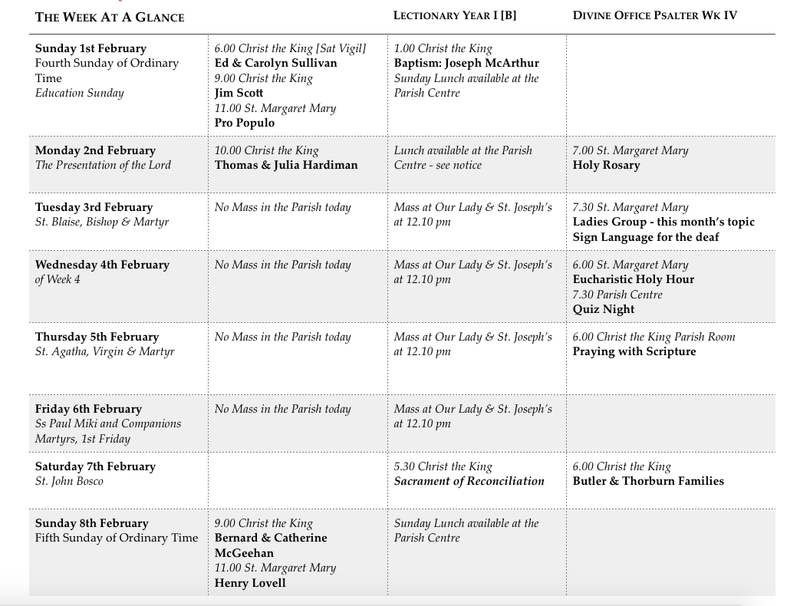 Classes will begin in Lent. Any parents wishing to enrol their children to prepare for this sacrament, please see Fr. Michael. The NEXT evening for men will be held on Friday 13th FEBRUARY beginning with Mass at 7.00 pm, a spiritual talk and adoration before retiring to the Parish Centre for refreshment. The recollection for women will be held on Friday 20th FEBRUARY - this will be held in the morning at Christ the King beginning with Mass at 10.00 am, a spiritual talk and adoration followed by refreshments in the Parish Room. The theme will be ‘The Holy Family’. Our diocesan pilgrimage to Lourdes takes place 24-31 July; flights from Manchester airport; prices from £725. Please obtain copies of the booking form from the organisers: 0161-883-1515 or info@mancunia.com. Bible Alive offers a daily reflection/meditation based on the Scripture readings used at the daily celebration of Holy Mass. The edition for Lent is available to purchase - cost £2.25. Please consider buying a copy. 225 at Mass with £690.56 Thank you. This group needs your help. We are looking for any baby clothes and/or equipment to provide help to many families in our area who are struggling to provide for their babies. Most of these items cost less than a £1 or could be second hand but in very good condition. Collection boxes can be found in both our parish churches with some examples of items needed. Thank you for your support. Copies of the Diocesan Newspaper are available to be taken home this weekend…please do take one home with you. Lent will soon be upon us. Over the past couple of years Fr. Michael has delivered a series of talks based on the Sunday Gospels or the Triduum. This year we’ll have a ‘Book Club’ style study group using the book Holiness for Everyone by Eric Sammons. The ISBN number is 978-1-59276-944-5 and is available from Amazon or other sites. Groups will meet on Wednesdays in Lent to consider the themes the book proposes. Doesn’t meet this week but anyone interested in being received into full Communion with the Catholic Church this Easter or if you just want to know more about the Catholic Faith, please feel free to come along to these meetings. Please continue to pray for vocations to the priesthood and religious life. Remember on Monday 2nd February to come along to Mass to pray for vocations. Fr. John Millar will celebrate Masses in the parish on the weekend of the 8th February and talk about how we can all help promote vocations to the priesthood. Discipleship: a new way of living is the theme of a day of renewal led by Charles Whitehead, St Clare’s parish hall, Sharoe Green Lane, Preston PR2 9HH; Saturday 7th February, 10.00 am - 4.00 pm. Contact Bernard Loveland, 015395-63391. Next day of renewal in Preston: 27th June, with Kristina Cooper. All non-perishable items welcome: particularly UHT milk; small bags of sugar; tinned sponge puddings; custard (tinned or packet instant); tinned tomatoes and cereals. Our diocesan youth service invites applications for a gap year at our residential youth centre, Castlerigg Manor in Keswick, September 2015. For more information and a pack please contact: team@castleriggmanor.co.uk, Tel: 017687-72711 or visit: www.castleriggmanor.co.uk. 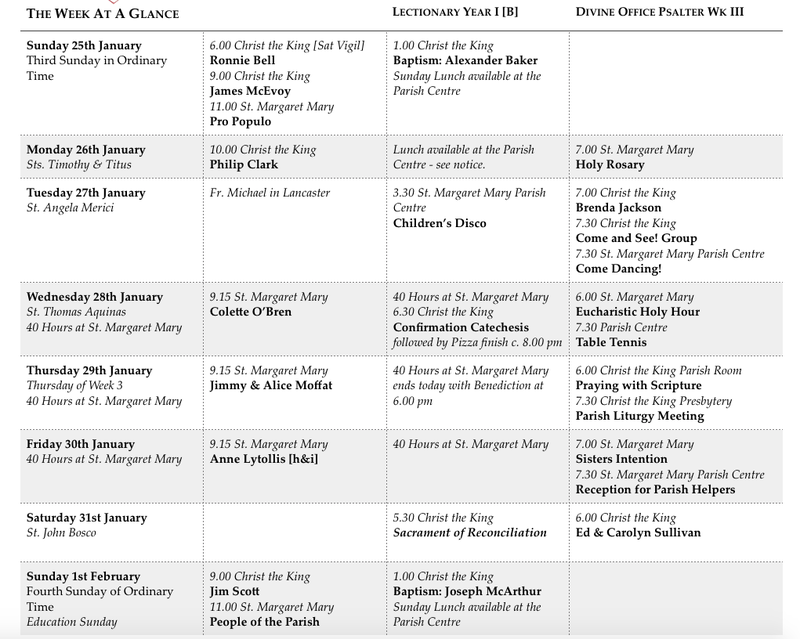 Beginning on Wednesday from around 10.00 am to 7.00 pm each day, there will be an extended period of Adoration of the Blessed Sacrament at St. Margaret Mary - please come along, even if only for a few minutes. Thank you to those who have sponsored candles - over sixty 7-day and over fifty 3-day candles will bear your particular prayer intentions before the Blessed Sacrament. On Thursday morning after the 10.00 am celebration of Holy Mass. Bishop Michael Campbell has agreed to come to the parish on Tuesday 28th April [at Christ the King] to celebrate the Sacrament of Confirmation. The next class be on Wednesday 28th January at 6.30 pm [due to Pizzas] - its still not too late to join the group. First Holy Communion will be celebrated in the parish on Sunday 14th June - our parish feast day weekend. 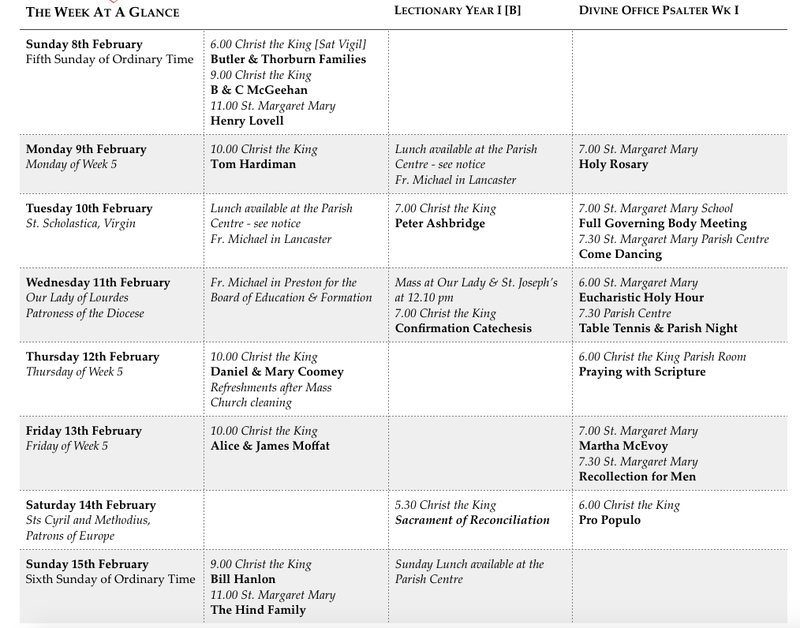 Classes will begin in Lent. Any parents wishing to enrol their children to prepare for this sacrament please see Fr. Michael. Thank you to all who helped organise the Hootsmon Party on Friday evening. 223 at Mass with £625.65. On Tuesday 27th January 3.30 pm - 6.30 pm. Tickets cost £1 and available from the Parish Centre. Lent will soon be upon us. Over the past couple of years, Fr. Michael has delivered a series of talks based on the Sunday Gospels or the Triduum. This year we’ll have a ‘Book Club’ style study group using the book Holiness for Everyone by Eric Sammons. The ISBN number is 978-1-59276-944-5 and is available from Amazon or other sites. Groups will meet on Wednesdays in Lent to consider the themes the book proposes. Meets this Tuesday at Christ the King. Anyone interested in being received into full Communion with the Catholic Church this Easter, or if you just want to know more about the Catholic Faith, you are very welcome at these meetings. There will be a discovery weekend preparing for Lent from Friday 30th January till Sunday 1st February at Our Lady and St. Joseph’s, Warwick Square. Open to all males aged 15+. Monthly days of worship, prayer and praise. The next date is Saturday, 31st January, at St Edmund’s Church, Orton Rd, Carlisle. All welcome. Renewal days start at 11.00 am and finish around 4.00 pm. Please join us even if you cannot stay for the full day. Tea and coffee provided but please bring a contribution to a shared lunch. Contact: Janice Wrench -01768 868489. There will be a meeting on Thursday evening at 7.30 pm at Christ the King to discuss liturgical matters for Lent and Easter. The Triduum will be celebrated at St. Margaret Mary this year. This will be between Wednesday 28th January and Friday 30th January at St. Margaret Mary. This period, traditionally known as Quarantore is a real opportunity for the parish to begin the New Year on a firm spiritual basis. Candles to be used during the 40 Hours can be sponsored for a particular prayer intention. Forms are available for this purpose in both churches. 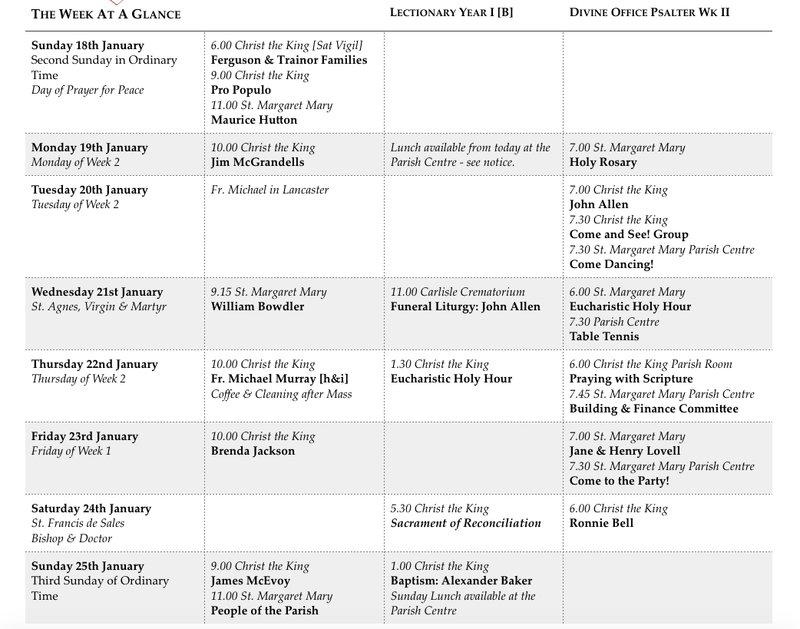 Please also sign up to ‘watch’ the Blessed Sacrament - sheets are available for this purpose. Thanks to the generosity of parishioners and groups within the parish, a new oven has been fitted to the kitchen. From Monday 19th January, there is a walk-in Lunch Club: tea, coffee, homemade cakes and scones, homemade soup and light lunches available from 10 to 2.00 Monday to Wednesday and from 25th January, Sunday Lunch will be served from 12.00 - 3.00 pm - includes a children’s menu. Please support this new initiative which supports the work of the parish. For more information, contact the centre manager Trevor Tiffin on 524295. Will meet on Thursday 22nd January at 7.45 pm in the Parish Centre at St. Margaret Mary. The NEXT evening for men will be held on Friday 13th FEBRUARY beginning with Mass at 7.00 pm, a spiritual talk and adoration before retiring to the Parish Centre for refreshments. Brave of Heart, a weekend retreat for men, 23-25 January, at the Cor et Lumen Christi community, Wigton, CA7 9HU. To book or for more information: stcuthberts@coretlumenchristi.org, or 016973-45623. On Friday 23rd to celebrate all things Scottish why not Come to the Party! Haggis, neaps and tatties and live music. Tickets are available from Douglas or Paul. 217 at Mass with £568.67. Meets this Tuesday at Christ the King. Anyone interested in being received into full Communion with the Catholic Church this Easter or if you just want to know more about the Catholic Faith, you are very welcome at these meetings. Fr. Michael's Homily preached on the weekend of the Baptism of the Lord. A lot seems to happened in our world since we gathered here last weekend. In our own context the we have marked the tenth anniversary of the floods which blighted the city of Carlisle; but our eyes, especially the eyes of our politicians, social commentators and the media have turned to another city and the shooting at the magazine Charlie Hebdo in Paris. How have you reacted? What have been your thought as you’ve watched events unfold? One of my initial thoughts, initial responses was to blame Islam - to consider that there is a fault line within Islam that tended to violence. ‘Muslims! Not again!’ [I didn’t say that - if I’m honest I said a few expletives - I swore] Those cries of ‘A****u akbar’, words that supposedly invoke the name of God, screamed as gun shots rang out and took the lives of human beings - beloved sons and daughters - sent chills down my spine. That phrase wasn’t just ‘proclaimed’ in Paris this week. The Islamic State continues with its ruthless persecution of minority groups in Syria and northern Iraq - Muslims as well as Christians. Boko Haram, another Islamic group in Nigeria have, according to Amnesty International, massacred 2,000 [mostly women, children and the elderly who could not run away fast enough] in the Nigerian town of Baga close to the border with Chad. But should I blame Islam? Muslim groups in France and across the world have condemned the Charlie Hebdo shootings - that those who have acted in the name of Islam are not Muslims. Their statements seem to echo those of our Holy Father Pope Francis that such attacks undermine “the fundamental good of peaceful coexistence of people despite national, religious and cultural differences”. I suppose that is the the agenda of ISIS, Boko Harram, those who struck in Paris - to undermine the fundamental good of peaceful co-existence. They want me to blame Islam, to blame Muslims - not see the individuals who are responsible, the individuals who take their hands to the sword, the gun and the bomb but rather see my Muslim neighbour as an agent of violence and in turn make me think of violence, to make me think like them. The agenda is not about free speech, despite what the liberal commentators may say. Holding pens in the air and declaring Je Suis Charlie is not answer - our brothers and sisters dying in Syria and Nigeria were not satirical cartoonists! It is not about free speech. [And don't think that those cartoons were something you'd find in The Daily Telegraph or Private Eye: they were offensive - to Muslims, t Christians, to Jews]. The agenda is not free speech. 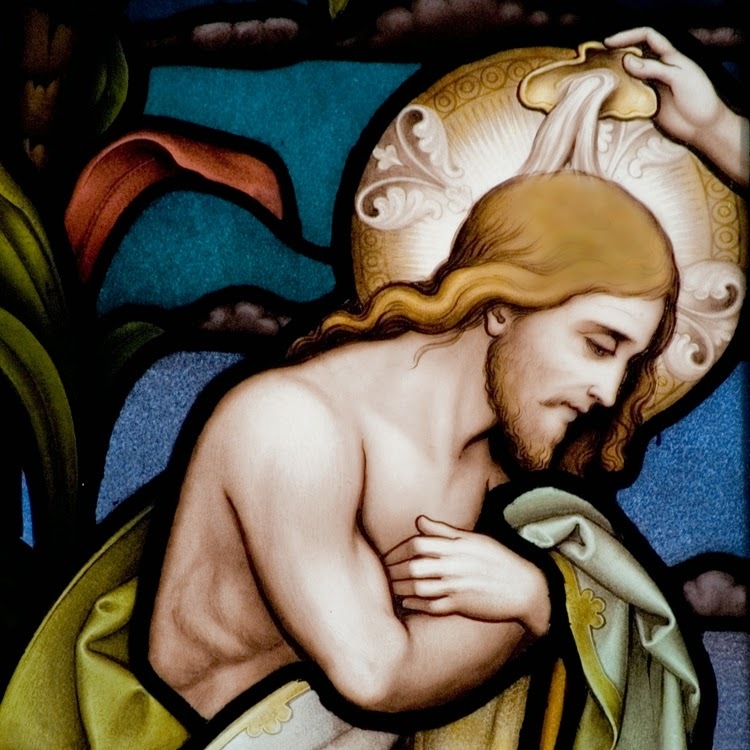 The agenda is about the very nature of what is means to be a human being and the dignity we possess as human beings made in the image and likeness of a God who is love and who reveals that love in the ministry, life and death of a beloved Son, Jesus Christ. Human dignity as sons and daughters of God - called to communion, to share in God’s life is the Gospel we proclaim.
. To see in the least of our brothers and sisters our Saviour - revealed to us as Son of God - the beloved Son struck down by men of violence…killed by you and killed by me. There will be an extended period of Adoration of the Blessed Sacrament between Wednesday 28th January and Friday 30th January at St. Margaret Mary. This period, traditionally known as Quarantore, is a real opportunity for the parish to begin the New Year on a firm spiritual basis. Thanks to the generosity of parishioners and groups within the parish, a new oven has been fitted to the kitchen. From Monday 19th January there is a walk-in Lunch Club providing tea, coffee, homemade cakes and scones, homemade soup and light lunches -available from 10.00 to 2.00 pm Monday to Wednesday and from 25th January Sunday Lunch will served from 12.00 - 3.00 pm - including a children’s menu. Please support this new initiative which supports the work of the parish. For more information, contact the centre manager Trevor Tiffin on 524295. Will meet on Thursday 15th January at 7.30 pm in the Parish Centre at St. Margaret Mary. Bishop Michael Campbell has agreed to come to the parish on Tuesday 28th April [at Christ the King] to celebrate the Sacrament of Confirmation. Classes will resume this Wednesday 14th January at 7.00 pm - its still not too late to join the group. 228 at Mass with £678.69. The White Flower appeal [for SPUC] was £171.92. Thank you. Meet on Monday evening at 7.30 pm. 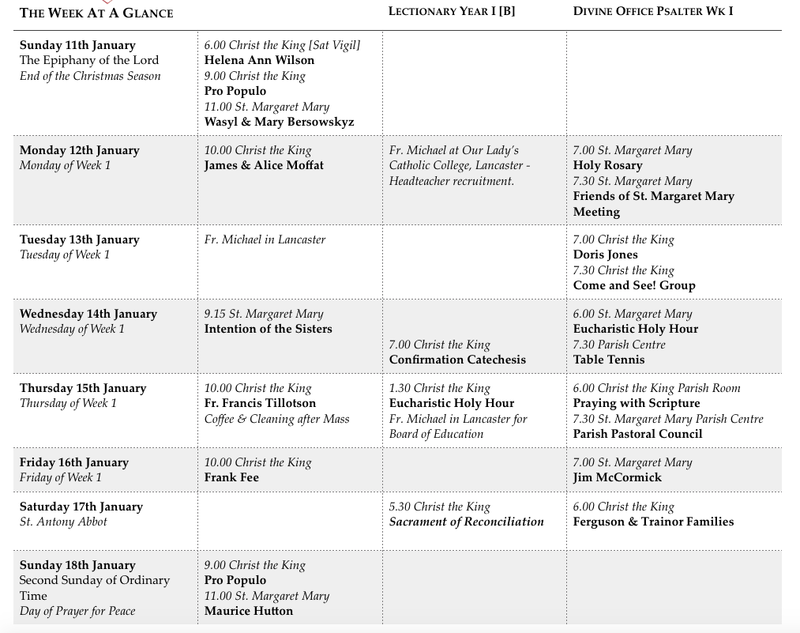 We resume this Tuesday 13th January at Christ the King at 7.30 pm. Anyone interested in being received into full Communion with the Catholic Church this Easter, or if you just want to know more about the Catholic Faith, is welcome at these meetings. A resource for children in the parish is available each week. at Cor et Lumen Christi Community, St Cuthbert’s, The Old Convent, Wigton. All welcome! For information call 016973 45623.